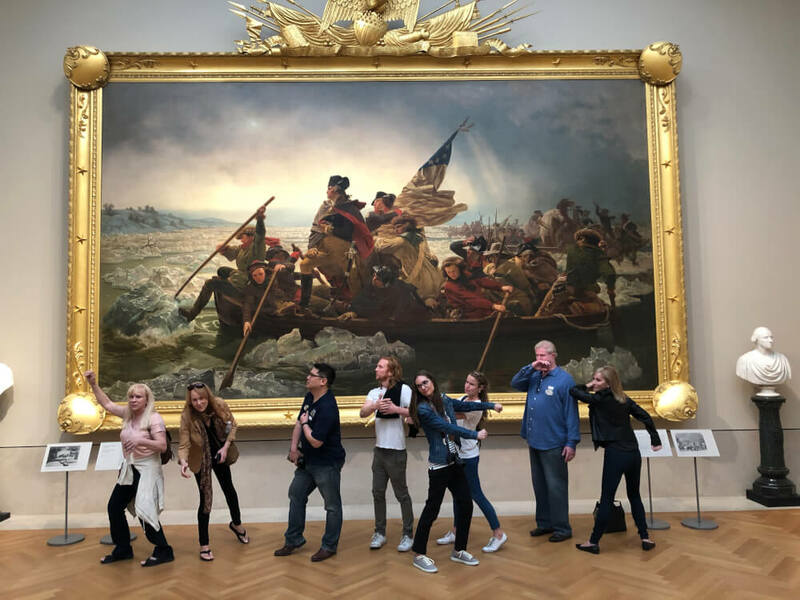 Are you asking yourself “What is Museum Hack?” Well, it’s a museum tour company that doesn’t do traditional (aka boring) museum tours. Their tagline is: We Lead Unconventional Tours of the World’s Best Museums. 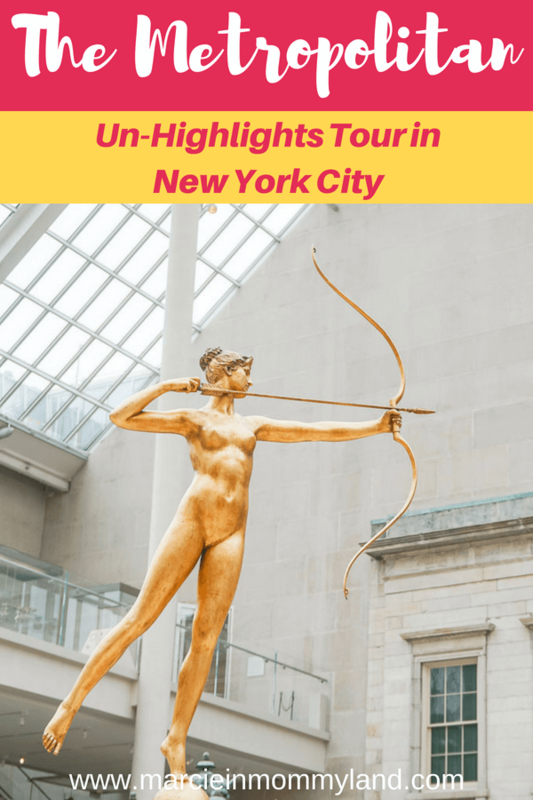 These tours actually started at the Metropolitan Museum of Art in New York City and their “un-highlights tour” puts an alternative spin on the museum. Be prepared to hear some of the strangest and hilarious stories hidden throughout the museum! 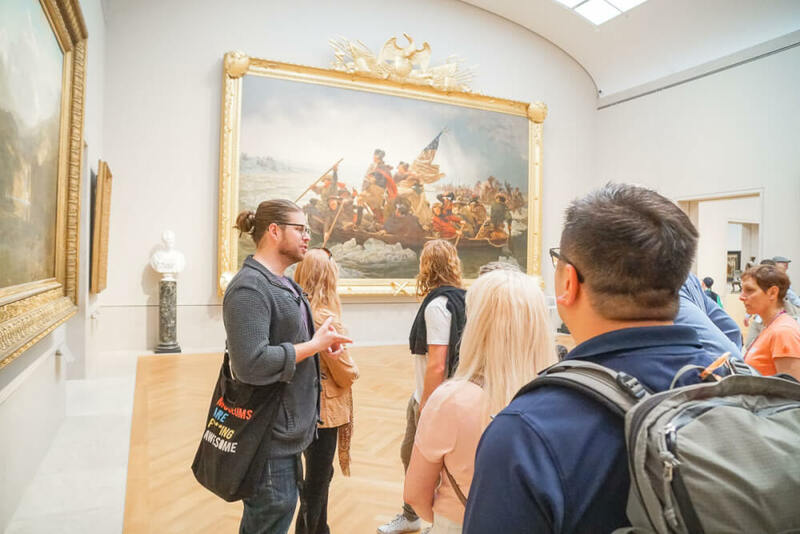 Museum Hack currently offers tours in the following cities: New York City; San Francisco; Los Angeles; Washington, DC; Chicago; and Philadelphia. 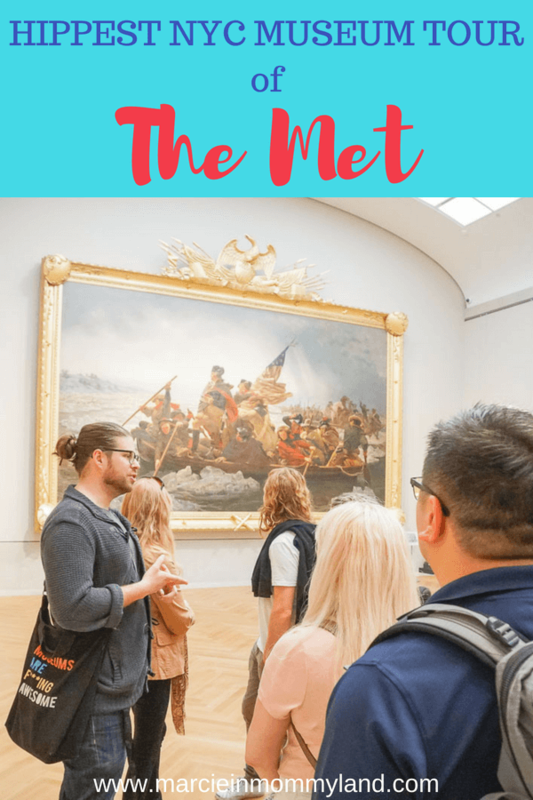 Since we were heading to New York City for the first time, we opted to do the tour that started it all: The Metropolitan Museum of Art: Un-Highlights Tour. New York City is home to some of the world’s most famous museums. Since my husband and I only had 4 days in New York City, I knew we couldn’t hit them all. That’s why this 2 hour Metropolitan Museum of Art first appealed to us. Two hours seemed like a respectable time to look around The Met without spending the entire day there. Then, I read the tour description on the Museum Hack website. It basically said the tour was made for both people who love museums AND those who can’t stand museums. 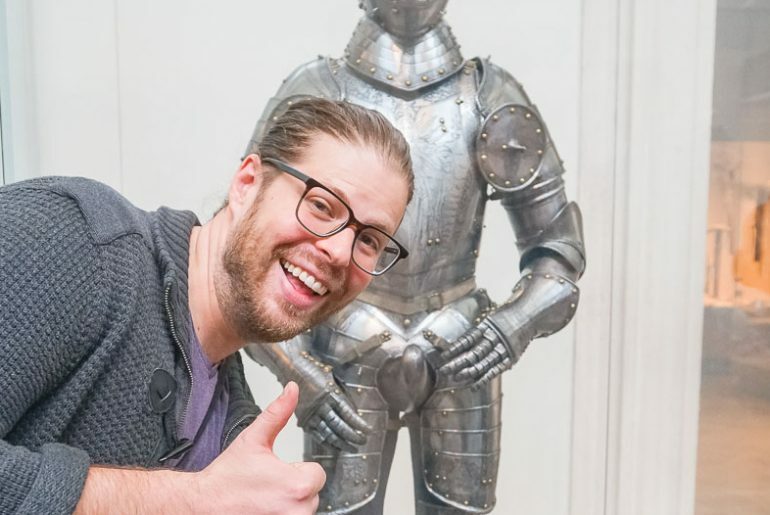 It promised a high-energy tour that zips around The Met while pointing out the crazy true stories behind some of the pieces of The Met’s massive art collection. 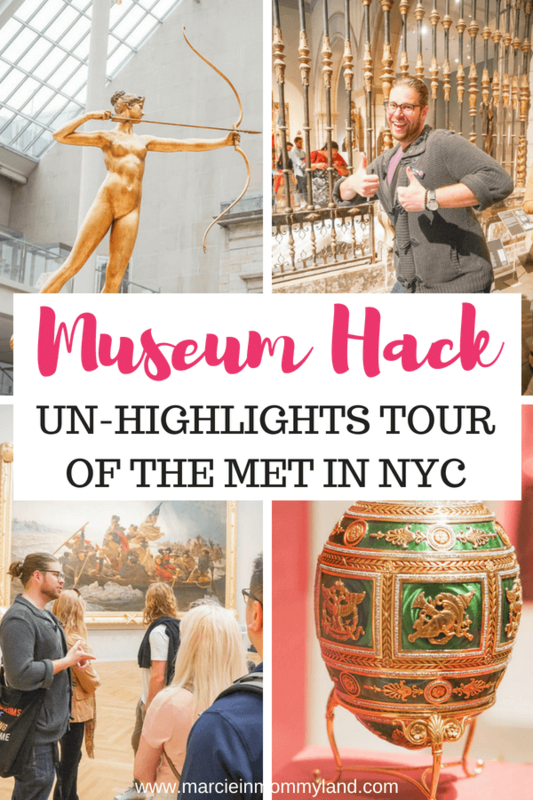 Since we were looking for fun activities in New York City, this tour seemed perfect for us! I really, really don’t want to give away the secrets. And if you are thinking about signing up for this tour, I URGE you not to research it too much. We went into it not knowing much about the itinerary and I’m so glad it was all a surprise! I mean, that’s such a big part of this Museum Hack tour! But, I will say that we saw a variety of paintings, sculptures, armor, and structures. Most of the time was spent in one half of The Metropolitan and we saw some of the top exhibits. However, we also got to explore the collection storage area, which was much more fascinating than it sounds. WHAT MAKES THIS MUSEUM HACK TOUR UNIQUE? I always look for quirky things to do when we travel. 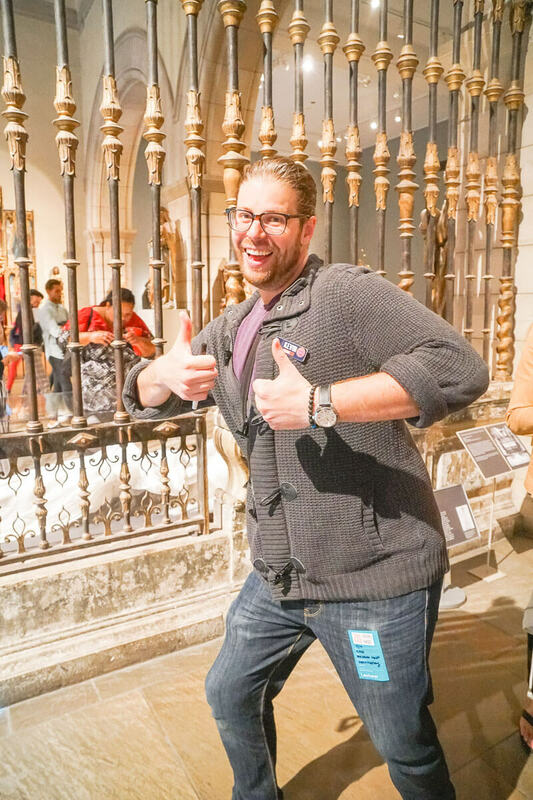 Reading the descriptions of the various Museum Hack tours made me giddy. I admit, I’ve been geeking out over this for months. I even lamented to my husband that we should have done The Getty Center: Un-Highlights Tour when we were in Los Angeles earlier this year. Our guide was a professional comedian. And I don’t mean that he told corny jokes. He was an actual comedian who knew how to present the information in a hilarious way that felt natural. We did a crazy photo opp. Right there in the middle of The Met with people watching. Like we owned the place! We got to play games. And not boring, lame games. Games that you could play at any museum to liven things up. We burned off breakfast racing through the museum. When people say that New Yorkers walk briskly, they aren’t joking. But, zipping through the museum not only let us cover a lot of ground, but also energized us! It re-kindled our love of museum tours. Normally, when we finish a museum tour, our brains are spent and we’re ready to sit down somewhere an eat. We’re usually bored at the end and dread visiting any more museums. But, this Museum Hack tour totally changed our minds! My husband and I LOVED LOVED LOVED this Metropolitan Museum of Art tour! We enjoyed it so much that we immediately got on our phone to book the Museum of Natural History Un-Highlights Tour. This was the first time we’d done a museum tour packed with information that felt digestible. In fact, after doing this tour, we were inspired to spend another hour looking at some of the other exhibits. Our guide purposefully ended the tour in an area we hadn’t explored yet so we’d be encouraged to stay longer. It was great that we got the lay of the land and were able to navigate this massive museum pretty easily. The real lasting impression of this Un-Highlights Tour of the Met is that it truly appeals to everyone on some level. If you are passionate about art, you’ll love learning the crazy stories behind the art. If you aren’t a fan of art, you might enjoy hearing about scandals and museum secrets. And even if you’ve been to The Met before, chances are you’ll discover something that will amaze and shock you. We felt like total VIPs getting the behind-the-scenes stories. It was like we were part of the “in crowd” and our guide was an old friend. We walked around like we were supposed to be there and that we were on an important mission to see specific spots as quickly as possible. By the end, we were so excited about The Met and started talking about when we could come back in the future. 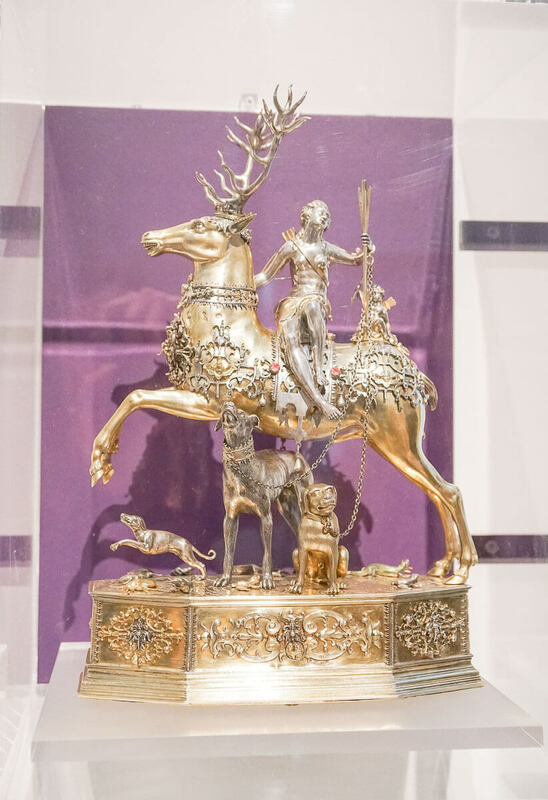 Is this Metropolitan Museum of Art Tour Right for YOU? Do you dread audio tours? Do you think art museums are boring? 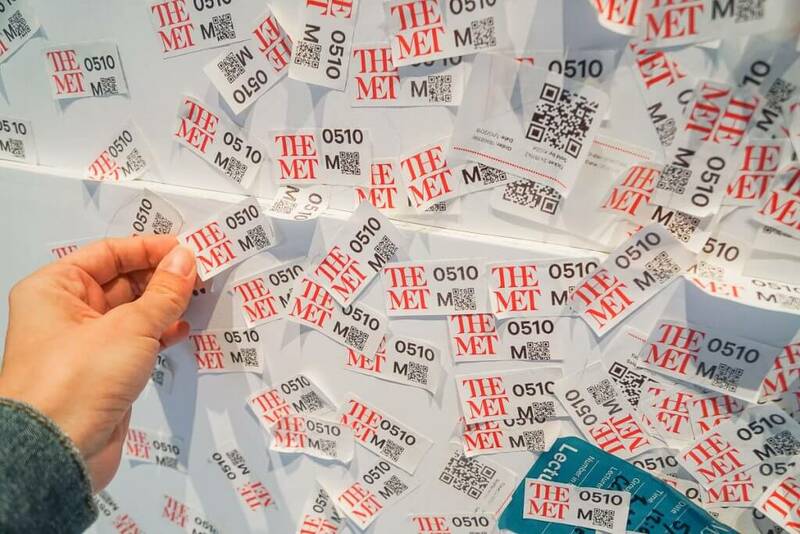 Are you overwhelmed by the size of The Met? Are you traveling with someone who spends way too long at museums? Have you been to The Met before and want a completely different experience? Would you like to learn stories that you can amaze your friends with later? If you answered yes to any of those questions, then you should sign up immediately! If you are a coffee drinker, fuel up before the tour. It’s fast-paced and full of awesomeness and you’ll want to keep up! The worst thing would to be sleepy and miss out on the fascinating details. The Met has a security line to go through. We didn’t count on that, so we were worried we’d be late to the tour. With it being a popular museum, the line can be really long. Actually, I’d say this advice works for anywhere you go in New York City. But, you will be walking quickly through The Met. I’d personally avoid high heels or slippery shoes. The floor is a bit slick. We happened to be there a few days after the 2018 Met Gala. Apparently that’s the busiest week for people visiting the Metropolitan Museum of Art because they keep the displays up for a bit. Don’t let the crowds discourage you. I personally get stressed out in crowds, but I didn’t feel overwhelmed. Instead, I felt really privileged to be able to walk around exhibits that were a part of pop history! During warm weather months, The Cantor Roof Garden Bar serves drinks and snacks on The Met roof. From up here, you’ll have unbeatable views of Central Park and the Manhattan skyline. Plus, it’s a great place to take a moment and plan the rest of your day. When we were visiting in May, the Roof had just opened to the public. However, it started raining right as we were waiting for the elevator to head up to The Met rooftop bar, so they closed it. We tried going back after it stopped raining, but it was closed for the day. My husband likes to half-joke that he hasn’t met a gift shop he didn’t like. The Metropolitan Museum of Art Store may be my favorite museum gift shop ever. They even had those trendy lapel pins that I’m now regretting I didn’t buy. They were only $11, which makes them a nice NYC souvenir. Plus, they don’t take up much space in a suitcase. So, while this particular Museum Hack tour is geared for people ages 16 and up, they do offer a family tour called Little Hackers. This may be the hippest name for a family tour I’ve ever heard. Anyway, it sounds like a similar tour, but geared for kids ages 13 and under. This is the tour we’re planning on doing with our boys when we do a family trip to New York City in the next couple of years. Museum Hack provided press tickets for review purposes. All opinions are my own. We have never laughed so much inside a museum! I absolutely love this so much! This is soooo right up my alley! 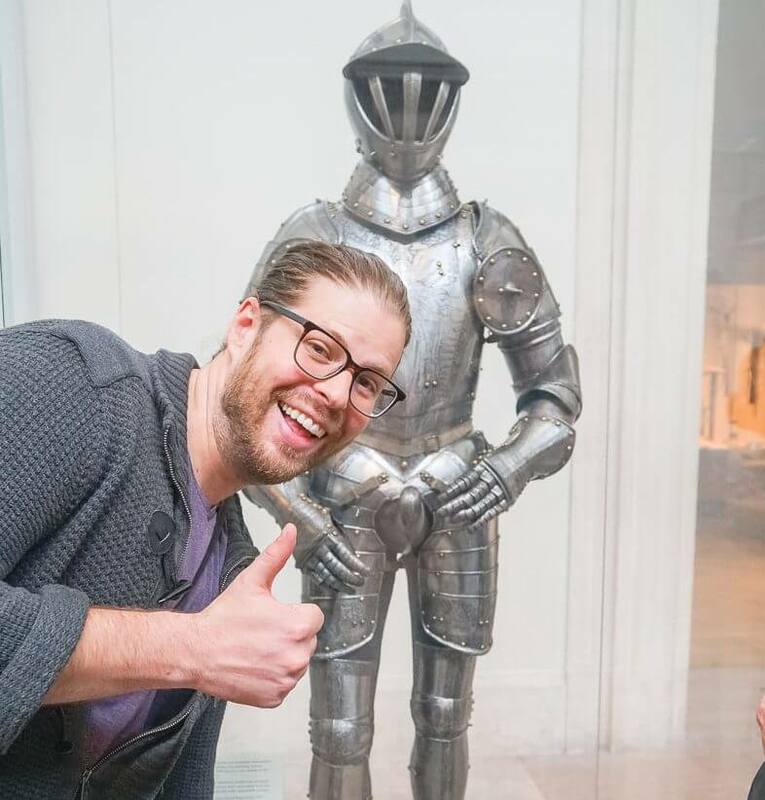 My husband and I are total goofballs like this and I would have never thought to do it at an Art Museum. Pure genius! Yes! Isn’t it a brilliant idea? They have been popping up in cities all over the US so I’m excited to try a few more in the next couple of years! These are awesome ideas and hacks! We are heading to some museums this summer so this will come in handy! Yes, keep our eye out for Museum Hack! They offer tours all over! This sounds amazing. I’m looking for fun side trips this summer and will look for these. Glad to help! I’m going to look for these tour on all our upcoming travels! This looks like a great time! Thanks for the tips! They offer tours all over the country! 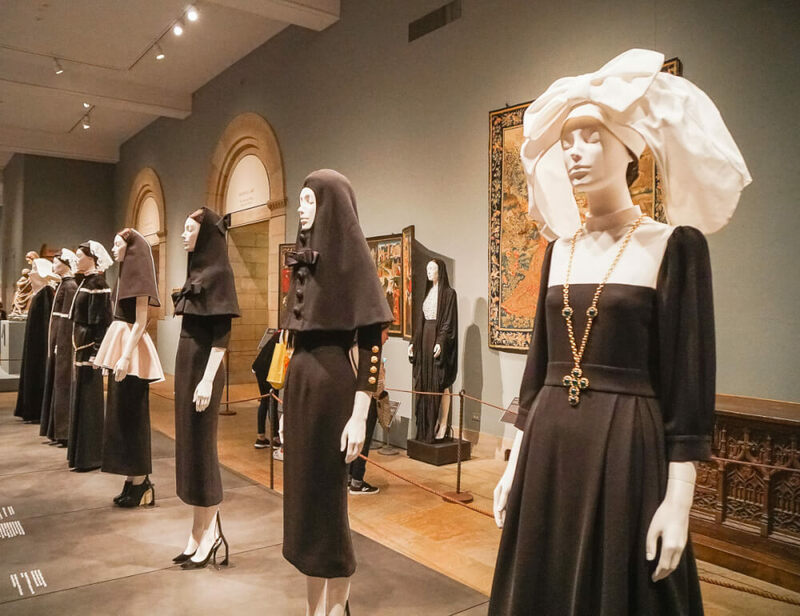 The clothes exhibition was for The Met Gala and it was spectacular! Yes, Museum Hack offers such a cool experience! Sounds like you had an amazing time. We’ll absolute check Museum Hack next time we’re in NY! It’s a very hip tour company! This sounds so awesome !! Though i genuinely just love walking around museums, this would be great for my husband who gets a little bored. He would probably love it! It’s upbeat and there’s tons of fascinating backstories I wouldn’t have known otherwise. This sounds like so much fun!! I lived in NYC for years and never went to the Met, can you believe that? Maybe on one of our trips I will go with my husband, this tour sound like so much fun! What a tragedy! You know, most of us probably don’t experience everything our city has to offer. Hope you get to see it soon! I LOVE the MET. It’s by far my favorite museum I’ve ever been to. Each time I go I see something new that I didn’t know they had. I would love to take this tour on my next trip so that I can have a guide point out even more magic. Yes! And they have a few other tours there you might really enjoy! This sounds amazing! I’m headed to NYC at the end of the year and am definitely squirrelling this away for the to-do list.